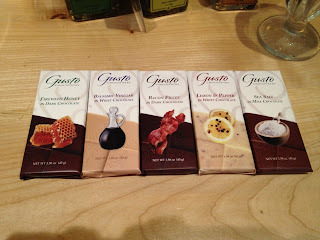 My favorites were the Fireweed Honey in Dark Chocolate and the Sea Salt in Milk Chocolate. Karen says that she uses the Lemon Pepper in White Chocolate on salmon or chicken. I think I need that recipe! 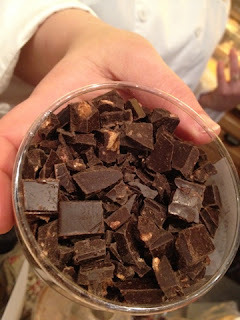 I caught a quick interview with Karen about why she chose chocolate as her profession. My favorite part is when she describes her experience working with gananche for the first time. So sorry about the audio in this video. I have a new directional mike that was supposed to pick up voices better. It sure does...the voice of every conversation and every kid screaming for an entire block! The Chocolate Box is really not as loud as this seems to indicate. Thank yo to Karen for letting me sample your entire new line! The amount of care and precision that you put into each flavor profile is amazing! 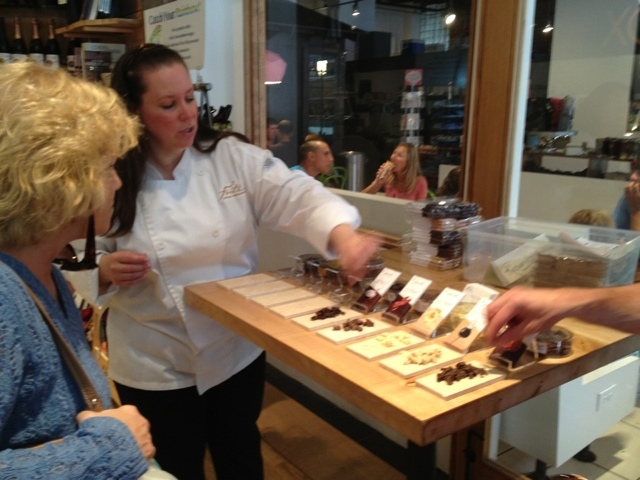 Thank you also to Michel and Valerie Brotman of The Chocolate Box for letting us shoot a video in your chocolate and wine shop on a busy Saturday afternoon!